You have probably heard about money laundering. But what about Room Laundering? Director and writer Kenji Katagiri wants to tell you more about that in his same-titled debut film. Room Laundering means to restore the reputation of an apartment. Why was the Reputation damaged? Because someone got killed or killed himself there. The Japanese law demands the landlord to inform the new tenant about the previous happenings, which will make it very hard to sell the apartment. There is a loophole, though. This information obligation lasts until the first new tenant after the incident, moves in. And this is where the story kicks in. Miko, played by Elaiza Ikeda (“The Many Faces of Ito” 2017), is a young woman, who works as a placeholder. Whenever there is a murder room or a suicide apartment, her phone rings and she has to move in, with her suitcase and goose lamp, to launder the property. Actually, Miko doesn’t need to have any special qualifications, which makes the job quite likable. If it were not for the ghosts that appear in front of her. Because Miko has the ability to communicate with the dead and during her stays in these haunted places, she gets involved in their business of finding peace. Ironically Miko has no friends in the real world. As an orphan, she grew up at her grandma’s and after her death, her uncle took care of her. He is also the one who manages her “laundry business”. Having trouble finding her place in the real world, Miko shares the same fate as the ghosts that haunt her. Taking life advice from suicidal ghosts sounds kind of like a bad idea, but together they manage to solve their issues. 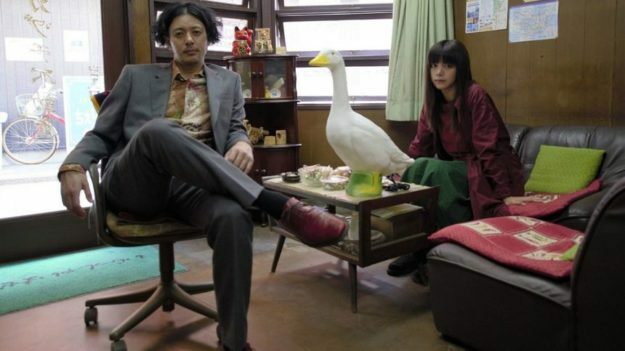 There is a punk, played by the brilliant Kiyohiko Shibukawa (“Lowlife Love” 2016, “Midnight Diner” 2015, “Fish Story” 2008), who killed himself before he had the courage to send his music tape to a record company. Miko helps him to get his music released posthumous. Then there is also a woman, portrayed by Kaoru Mitsumune (former member of the Girl Group AKB48), who got stabbed in the back because she was too selfish. Miko helps her to find her murderer. On the one hand, the film is rare in temporary Japanese mainstream cinema because it does come up with an original script, that didn’t originate from a manga or a novel. On the other hand, the film is lacking depth. Starting out with a very promising prologue, the film fails to intensify the cinematic experience. Since “Room Laundering” is planned as a comedy, one isn’t expecting nail-biting suspense, but a natural portion of humor is missing, though. The movie loses itself between the romantic-comedy and horror genre. This undecidedness leads to a certain bystander apathy on the viewer side. “Room Laundering” tries to be a modern-day fairy tale. Kenji Katagiri designs caricatural characters and also refers to some children stories, for example, “Lektro” by Reiner Zimnik. Unfortunately, this fairy tale contains no real menace, no dark side, that needs to be overcome by the characters. The overall representation of backstory wounds and challenges that emerge is too shallow. Therefore the final impression of “Room Laundering” feels like a missed out opportunity. Great idea, great script, great actors, but in the end, the movie didn’t have the heart to go beyond mainstream cinema.